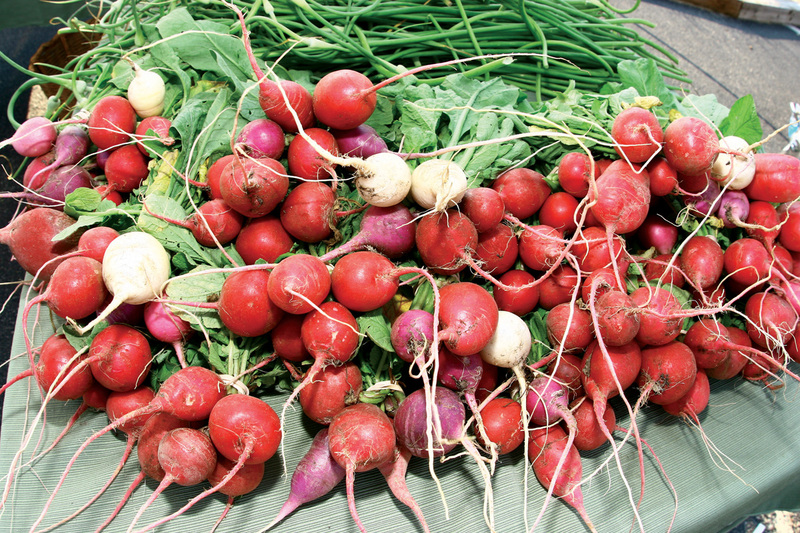 Radishes fresh from the farm are on display at a local farmers’ markets. Besides shopping the roadside stands, people can browse weekly farmers’ markets across rural Delaware, including four nearby locations, in Fenwick Island, Bethany Beach, Sea Colony and Georgetown, plus more across the region. Plus, much of the produce was just picked that morning, the pies just baked or the honey harvested from bees feeding on local flowers. “Many of our farmers are multi-generational and have Century Farms, meaning that farm has been on continual production for at least 100 years. By providing a space for local farmers to meet and sell to our community, we are saving these farms and preserving the agrarian legacy of Delmarva,” Bennett said. Plus, it builds community, as the farmers look forward to seeing the same familiar faces every week or year, said Albert Hudson of Hudson’s Produce. While many of the small businesses accept credit cards, cash is still king for many others. Also, most markets operate rain or shine, so it’s advisable to check websites or Facebook pages before heading to the market. The Fenwick Island Farmers’ Market is open on Fridays from 8 a.m. to noon, from June 8 to Aug. 31. It is hosted at the Warren’s Station restaurant parking lot, on Route 1 bayside, at 1406 Coastal Highway. Goods include fruits, vegetables, herbs, native flowers and grasses, honey, eggs, cheese and bread. Parking is free on site. Nearby roadways may require a paid parking permit after 9 a.m.
For more information, visit www.fenwickislandfarmersmarket.com. The Farmers’ Market at Sea Colony is open on Wednesdays from 8 a.m. to noon, from June 6 to Aug. 29. It is hosted at the Marketplace at Sea Colony shopping center, on Route 1 southbound, at 33546 Market Place, Bethany Beach. Goods will include vegetables, fruits, cheeses, flowers and more. Parking is free on site. Details are online at http://seacolonyfarmersmarket.com/. The Bethany Beach Farmers’ Market is open on Sundays from 8 a.m. to noon, from June 3 to Sept. 2. It is hosted in the PNC Bank parking lot at Garfield Parkway and Pennsylvania Avenue in downtown Bethany Beach. People can purchase fresh fruit, vegetables, flowers, cheese and more. There will be a ceremonial ribbon-cutting for the Bethany market’s 12th season on June 3. Paying at meters or use of parking permits is required after 10 a.m. Details are online at www.bethanybeachfarmersmarket.com and www.facebook.com/bethanybeachfarmersmarket. The 16 Mile Farmers Market is open on Wednesdays from 4 to 7 p.m., from May 16 to Sept. 19, hosted by 16 Mile Brewery, 413 South Bedford Street, Georgetown. Shoppers can buy produce, meats, soaps, flowers, pastries, local honey and more. Parking is free on site. Details are online at www.facebook.com/16milefarmersmarket. Point Intern Megan Kotelchuck contributed to this story.